To Comment or Not to Comment, Is that the Question? It has been interesting following the #28daysofwriting initiative organised by Tom Barrett. The premise behind it is that committing to a month of regular posts will hopefully help develop a sustainable habit of writing and reflection. I have not participated as I feel it best to commit time when I have it and also write based on need, rather than time. Sometimes this may mean going beyond the rudimentary four paragraphs every now and then, but so be it. Anyway, I digress. One of the observations that has arisen is the lack of comments occurring amongst the various posts. A lot of people are writing a lot of things, but not many people are actually responding. The proposal that has been put forward is a return to commenting with #28daysofcommenting. Now I am not against comments, as demonstrated by my recent post. As I have said for a long time, responding is an integral role to reading. The challenge is making this visible to others. I have issues though with the argument that ‘micro engagement has killed off the edublogging community‘. 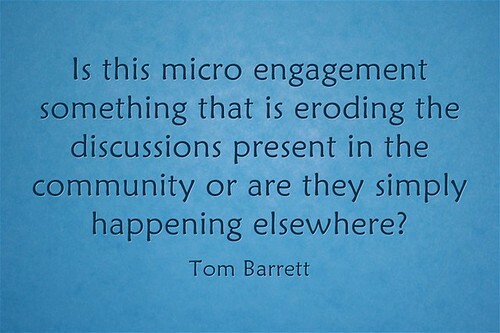 I do admit that things have changed, but I wonder if blaming this change on micro engagement is missing something more? In a post looking at issues with education today, Peter Skillen puts forward a range of arguments. One is that there can be no wisdom and development gained in one-line. Although I think that there is plenty of drivel out there full of excessive branding, self-promotion and back-slapping, as well as enough people engaging in what Doug Belshaw describes as ‘elegant consumption‘, I argued then and I would argue now, there there is still a potential to such interactions. Going beyond being a representation of our digital identity, Twitter offers a means for sharing the main idea, writing aphorisms and generating new ideas. It provides new beginnings if we are willing to take them. To look at this from a different perspective, Corinne Campbell made the observation that, “creativity requires design constraints”. What is often overlooked with a medium like Twitter are the constraints at play. I think that it is easy to get lost in the flow of things and forget that Twitter can just as easily be seen as a form of creativity. A point that Dean Shareski makes so well. The issue then is how to make the most of such constraints? As I have discussed before, there are different ways to share and respond. The easiest and quickest thing to do is to simply post a title and link. Something that Barrett puts in the red zone. However, in order to develop richer communities and smarter rooms, it is wise to include handles and hashtags. For me this includes both the author and anyone who I know the topic maybe applicable to. Going beyond this, I also try and post quotes rather than titles. For one it demonstrates a higher level of engagement with the text, but it also offers a different entry point for readers. This move away from commenting was brought home to me by Steve Wheeler’s reflection on his most read posts of 2014. His most read post was Learning First, Technology Second. It received over 8000 hits, yet only twenty three comments, half of which were his own responses. When quizzed on the matter of hits to comments ratio, Wheeler suggested that it is often the more emotive posts which usually gain the most interaction. I wonder if this has always been the case? A problem I have with comments is that with a move to mobile, they just aren’t as easy as they used to be. A majority of my digestion comes via Feedly. I then save posts for commenting later. Sadly, this does not always happen. Fifty posts later and I was left with an array of thoughts and ideas. I wonder if a blog would provide such engagement? This is where I feel that Blogger wins out over WordPress. I like the fact that comments are connected between Blogger and Google+. Lately, I have taken to sharing comments I receive just as a way of spreading great ideas. As an alternative, although I may not comment, I do connect. What I do is remix other people’s ideas into my own writing. They will often lay dormant, waiting, then something happens, they connect and spur on a new idea in a new context with a different perspective. What is different about remixes as opposed to connects is that it allows for multiple interactions. Pingbacks then connect back, something missing with Blogger. At the end of the day, there are many ways of continuing the conversation, whether it be Diigo, Facebook, Google+, Voxer, the list goes on. Although there may have been a reduction in direct comments, I wonder if there has been an increase in engagement overall? I love Robert Schultz’ endeavour to comment on at least one post a day, but I think if we are to move forward then maybe we need to look more closely at the problem? Is there a new idea that needs to be unearthed? What is your take? I encourage you to continue the conversation here. To Comment or Not to Comment, Is that the Question? by Aaron Davis is licensed under a Creative Commons Attribution-ShareAlike 4.0 International License. Thanks for the mention, and for sharing your thoughts on the topic of blog comments. Someone smarter than me stated that Twitter is a conversation, and it’s happening with or without us. Blogging is also a conversation, or at least it can be. My learning has been challenged, expanded, and deepened through the comments of others. Comments are like gold – rare and precious. I appreciate your technique in referencing other resources and contributors with your comments. You are a PLN builder!